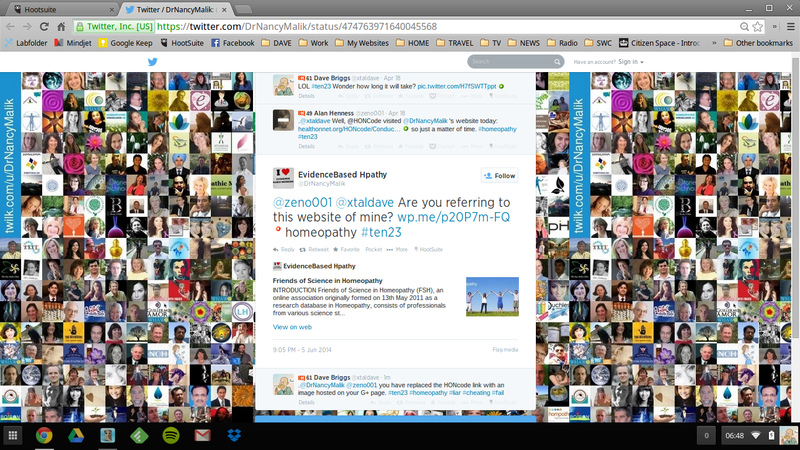 Those who have ventured “below the line” on articles regarding homeopathy will perhaps have come across “Dr” Nancy Malik, a prolific pro-homeopathy zealot who can be typified by her chronic inability to read and assess the articles she is touting as showing that her beloved modality is anything other than water. 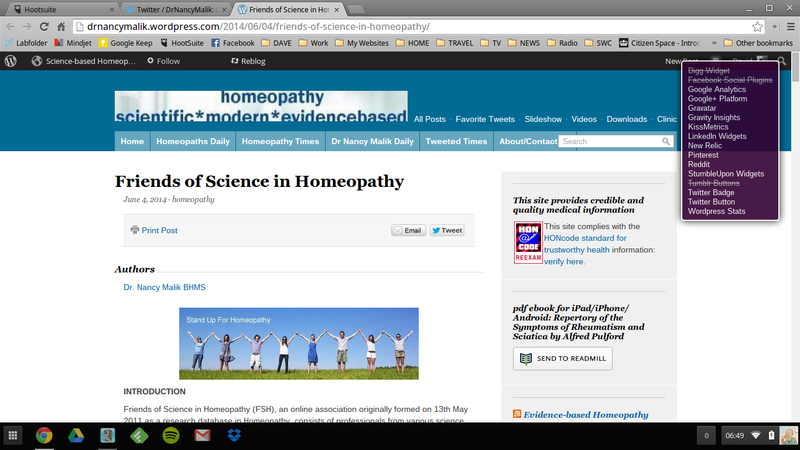 In the not too distance past, Ms Malik had a “knol” – a Google hosted blog where she collected all the scientific papers that she thought showed homeopathy worked. I assessed that here. Google pulled the plug on Knol, and Ms Malik migrated her site to WordPress. A few months ago, she got the site HONcode certified. HONcode is an independent organisation that promotes and certifies websites that they deem as giving reliable healthcare information. 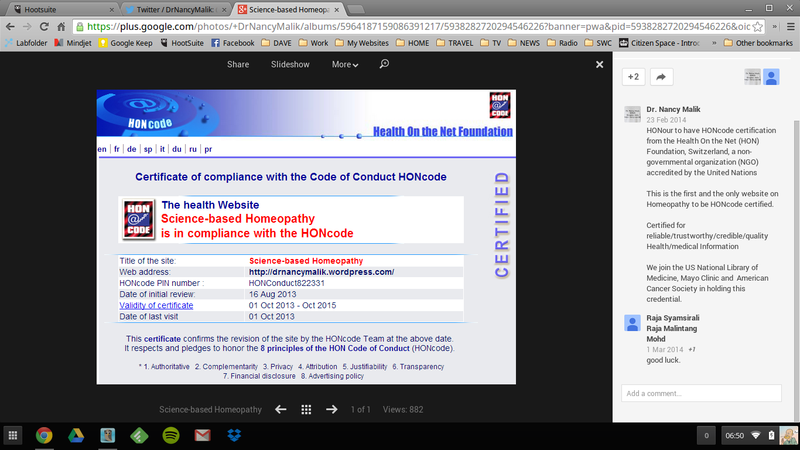 Obviously, I found it odd that HONcode (who seek to abide by the tenets evidence based medicine) would certify a homeopathy site. I raised this with them, and encouraged others to do so. 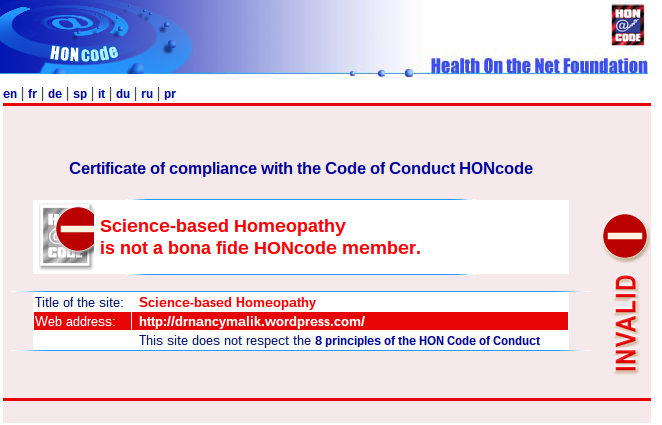 After a brief e-mail conversation, HONcode wisely chose to suspend Ms Malik’s certification, pending a review. 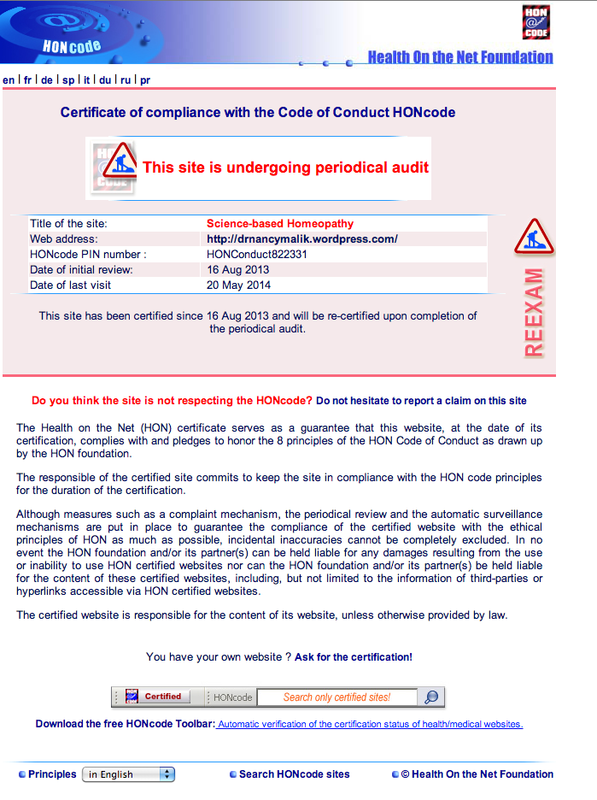 The HONcode logo on her site and the verification link (supplied by HONcode) changed to reflect this – now showing a ‘men at work’ sign with a red “ReExam” warning. Her website HAD been changed! Or had it? The HONcode logo still has the red “ReExam” logo, but when one clicked on the verify link… Something magical happened! … one is directed to an image of the original certificate posted on Ms Malik’s Google+ site in October 2013. Here is a freezepage link to Ms Malik’s WordPress site as of this morning, complete with link to her G+ site. This is a clear and unambiguous attempt to dupe the unwary into thinking that she retains HONcode certification. Happily it was so laughably crude that even my pre-coffee eyes at 6:50 spotted it. The genuine HONcode ceritificate for Ms Malik’s site is here. EDIT: I’ve added some links & an image of the genuine HONcode certificate. UPDATE: Alan Henness was the first of us to illicit a response from HONcode, who appear to confirm that they have rescinded their certification for Ms Malik’s site. Perhaps we might speculate that her sudden action on this issue (after 6 weeks of nought but silence on the matter) might have been precipitated by HONcode informing her of their decision? You are currently browsing the Anomalous Distraction blog archives for June, 2014.